Did You Know Denver Broncos Use Whole Body Cryotherapy? 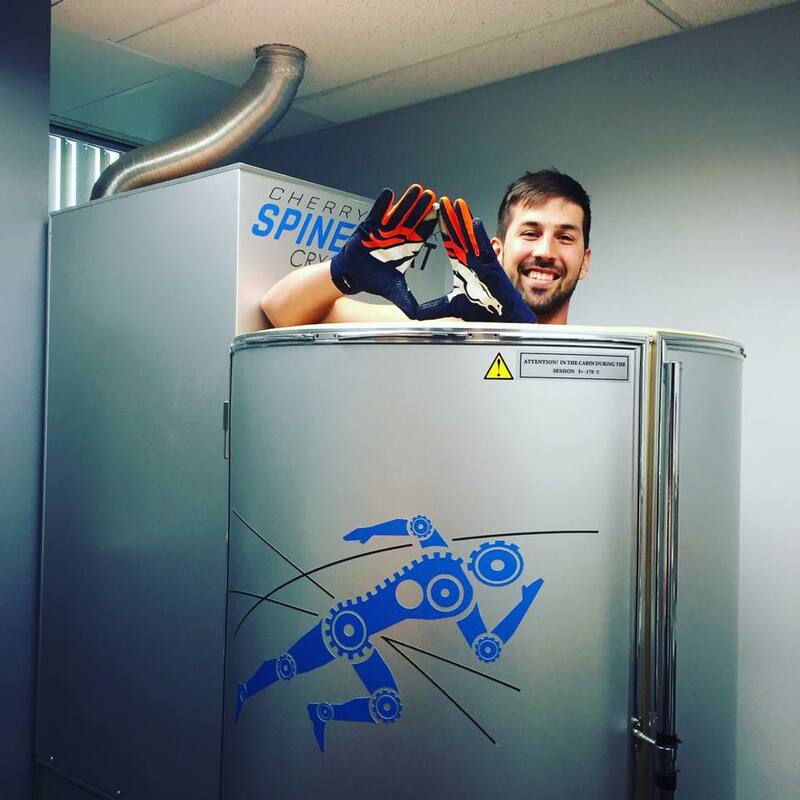 Brandon McManus of the Denver Broncos using whole body cryotherapy. Russel Okung of the Denver Broncos using whole body cryotherapy. 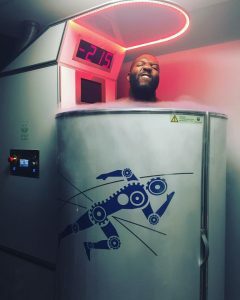 Now that you know the benefits and why these professional athletes utilize whole body cryotherapy, you might find yourself asking, “So, how does it work?” WBC is a cold air therapy designed to reduce musculoskeletal pain and inflammation. It works by standing inside a cryotherapy chamber for a treatment session that lasts only a few minutes. Cold, dry air is blown over the body to stimulate the sympathetic nervous system, causing a dramatic peripheral vasoconstriction followed by a dramatic vasodilation. A gaseous form of nitrogen is utilized to lower the skin surface temperature by 30-50°F over a period of 2 to 3 minutes. The skin reacts to the cold and sends messages to the brain that acts as a stimulant to the regulatory functions of the body. The skin exposure to the extreme temperatures also triggers the release of anti-inflammatory mediators and endorphins. This acts as a natural pain killer and helps to lower the systemic inflammation throughout the body by lowering histamine levels, or inflammation markers. Why are athletes so worried about inflammation? Any inflammation is a biological response of tissues and cells to injury and cellular damage. This acts as a protective attempt by the body to remove the injurious stimuli and to initiate the healing process. The problem is that the receptors involved in pain are also present in inflammation. Their activation causes the inflammatory reaction. These chemical signals released by damaged cells result in dilation of blood vessels, accumulation of white blood cells, warming of soft tissue and swelling. Cryotherapy combats this response by constricting the blood vessels, thus decreasing inflammation. This is why many of the Denver Broncos use whole body cryotherapy as part of their recovery process. Check out ESPN’s feature on Denver Broncos players in our clinic. It is extremely vital for a professional athlete to recover from intense workouts and games as quickly as possible. Utilizing this cutting edge technology to reduce pain and inflammation provides enhanced recovery benefits that are otherwise not possible. Many of the Denver Broncos use whole body cryotherapy 3-4 times per week to aid in recovery from practice and games. Other members of the defending Super Bowl 50 champions prefer to use WBC 1-2 times per week, usually the day before and day of the game, which is aimed at reducing pain and inflammation with the goal of enhancing game day performance. The other way that cryotherapy is commonly utilized involves multiple sessions in the treatment of injuries. The usual time frame for your acute symptoms to settle is 2-4 days post-injury, but this can vary. In general, the effects from each session last at least 6-8 hours and increase with the number of treatment sessions. If the Denver Broncos can benefit from cryotherapy, why can’t you? WBC is not just for professional athletes. Countless people are taking advantage of the many benefits of cryotherapy. This new technology can reduce injuries and decrease recovery time, which makes it beneficial for almost anyone. If you have pain and inflammation, whether it’s a new injury, an old injury, or general muscle and joint soreness, you can benefit from cryotherapy as well.